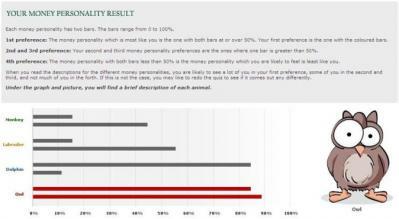 After you have completed the Money Personality quiz, a chart pops up with two bars for each animal. To help you understand what the chart is reporting, below is a brief explanation of what the two bars represent for the Owl. The top bar is looking at how a person prefers to collect information, or “perceive”. There are two core preferences for “perceiving” being considered here. The first is a preference to collect facts and details. The second is a preference to perceive patterns and connections. The Owl is more oriented to the second preference for perceiving. That is, a preference for perceiving patterns and trends, connections and possibilities. This Owl has this preference in common with the Dolphin. This is why the top bars for Owl and Dolphin are the same. The bottom bar is looking at how a person prefers to make a decision, or form a “judgement”. There are two core preferences for “judging” being considered here. The first is a preference to use thinking, logic and analysis, basing decisions on principles and reason. The second is a preference to use feeling, humanitarian type values, and emotional consideration when deciding. The Owl is more oriented to the first preference for “judging”. That is, a preference for making decisions through logic and reason, basing decisions on analysis. Each preference alone is interesting, however, by combining the two preferences we start to see the Owl preferences. Keep in mind that the questionnaire doesn't know you better than you do, so feel free to dismiss the reported animal type if you don't believe it depicts your preferences. Read more about the Owl preference here.